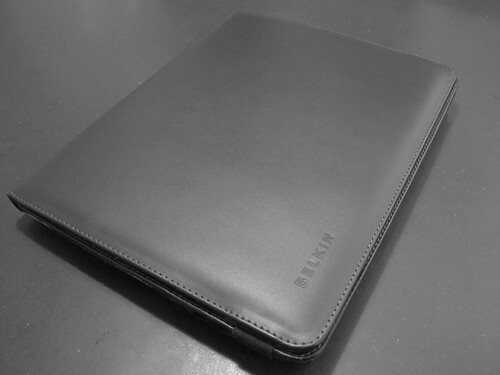 I don't do this very often, but I have an unusually strong recommendation for an iPad sleeve after having tried Apple's rubber sleeve and several Belkin sleeves: you want the Belkin Leather Folio. It's being held close with a wide rubber band that sits inside a groove on the back. When you untie the rubber band it sits on the front. You can just open the folio, or you can fold it back. It won't prop up your iPad like the Apple rubber sleeve, and it is much thicker, but I prefer the touch of soft leather to the rubber. Take a look at the other photos on Flickr that show you all the features. The Peat Sleeve is OK, the sock is very weird. The Leather Folio is the one I am going to use. geht nicht so richtig. Flickr will defaultmäßig Flash benutzen. :-) Der ist bei mir im Browser (MacBook) sowieso geblockt, aber der Steve´sche Puritanismus läßt nur eine singuläre Götzenanbetung auf dem iPad zu. Too bad they embossed "BELKIN" on it... the minimalist within cringes. if they didn't, their marketing droid would have comitted suicide or been fired. No temperature problems caused by running it inside the folio? Ulli, it does not come out as prominent as on this picture. 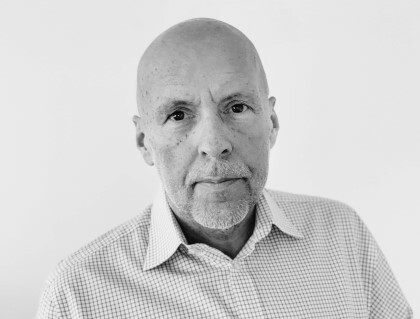 Jörg, no temperature problems. The iPad does not run hot at all. Unless of course you let it sit in direct sunlight. But that's an external heat source. Personally I like the cases from Noreve. They look great and the leather is really soft. Also the designer thought about how protect the device without limiting the use of the device. The iPod nano case is build so that I can use my fm transmitter without removing the case. Very nice. I have this one, from NewerTech. I like it a lot. It performed perfectly on the trip to #PandL. I highly recommend the Kensington K62911US Reversible sleeve. It is absolutely perfect fpr the iPad. Fits snugly, and looks really good. It comes in black and is reversible to grey. And the best bit... I picked it up for just $5.50 USD on Amazon US with free shipping!!! Ich kann dem nur aus vollem Herzen zustimmen. Schreibe dies hier gerade auf dem pad mit dem Apple-sleeve. Ich habe das Ding heute morgen bekommen und bin "unterwältigt". Praktisch die Aufstellung weil der Ablesewinkel gut ist, aber von der Kondomqualität des Applesleeve bin ich nicht überzeugt. Man hat das Gefühl, alles sitzt zu stramm. Das Apple-Ding hat zwei Vorteile: es ist sehr dünn und man kann ein Pult draus machen. Aber es fühlt sich "billig" an. Das Belking-Sleeve ist viel teurer, aber fühlt sich teurer an, als es tatsächlich ist. Es ist auch dicker und schwerer, aber mir gefällt es ausgesprochen gut. Mal sehen, wenn Belkin ein TPU Sleeve bringt, dann werde ich das zu Hause vielleicht verwenden. Auf Reisen aber kommt das iPad in das Leather Folio. It's taught on either the back or the front. It's loose on the inside, but I always string it to the front when open.